It’s been a few years since the last one, but I’ve finished another small flash game. This one is called “A game about dressing up cats as historical characters”. 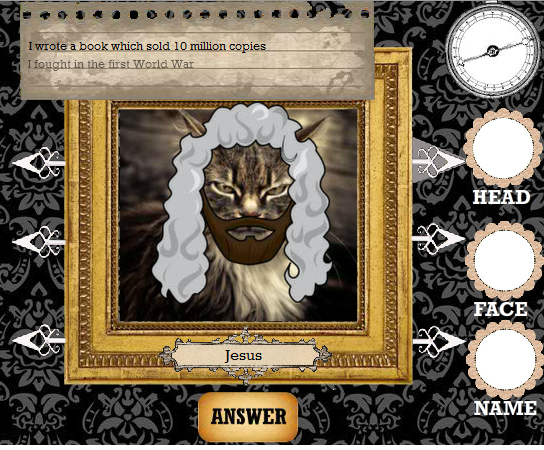 It’s a quiz game about dressing up cats as historical characters. It’s better to ship something imperfect than never ship. I had lots more grand plans for this game, including many ‘nice to have’ features. As the game is about making cats look silly, some sort of sandbox mode, with a “post image to twitter” functionality would have helped it get out there. 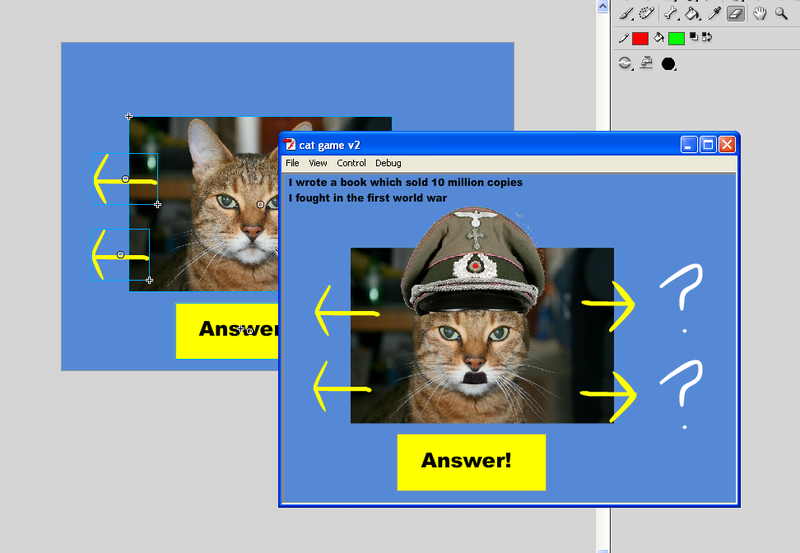 Also I would have liked more cats to dress up (currently there’s only one), and even convinced my own cat to pose in a suitable position (as is visible on the about page of the game). However I wasn’t committing the time to the game required to get these features implemented any time soon. After reviewing how the game’s production had stalled during 2012, at the end of last year, I decided to define the Minimum Viable Product – the least I have to have to get the game out there. This has been the plan ever since, and is the reason the game is out now. I claim no artistic ability, which is very restrictive when making a game. Being handy with photoshop, and using free-to-use images can get you quite far, but the game could definitely use more custom artwork. I ended up paying for an artist to do the beards and hats for the cats, since it’s integral to the design of the game – however since this was a hobby, I didn’t feel I could justify the expense of getting a professional to do extra art work. This means elements of the visual design have suffered, due to being made by me. This is particularly evident in the main menu. I wanted to portray an art gallery of famous pictures with cats added, and a prototype of this was made, however it looked rubbish. In the end, the paintings and curtains seemed the easiest way to portray this idea, while staying within my ability. 18% of people turned off the music. 83% of people started the game. 32% of people finished at least one round of the game. 20% of people started another round. No-one has yet played to the end and hence seen all the questions. These findings will be useful for updates to this game, or whatever game I make next. I have a few ideas about what hobby game I’d like to make next, but based on this game, it won’t be ready until 2018 at the earliest. So don’t hold your breath.